We're considering adding favorite notifications to the global inbox, and are looking for feedback on the idea (as we're not completely sold on it). Favorites are kind of like bookmarks, in that they're kept in a handy centralized place. They also follow you across browsers. Ok, ok... "bookmarks, on the internet" is not the most compelling feature, but Favorites also opted you into notices for those questions as if you were the owner (edits and new answers, at least). This was probably the most confusing part (though a requested feature) of the old envelope behavior judging by erroneous bug reports, so a way to opt out of this behavior was added. Now, favorite updates go nowhere. But we could* put them into the inbox. Every current user has their "notify me on favorite changes" preference cleared (new users start with it cleared). The first time someone favorites a question, they're prompted to opt-in to favorite notices. Whenever a question is commented on or answered (or, possibly, edited) a new notice is pushed into the inbox of users who have favorited it, and have opted in. Opt-in would be per-site, and it would remain possible to opt-out from your profile page. As I mentioned above, we're not 100% sold on this idea. We've had a policy to date that nothing goes into the inbox that isn't specifically targeted at a user; this would be tweaking that policy. *We could also put changes into their tab on the user page, but that reduces their visibility. I've seen this proposed before but I can't find the link. Anyway, how about a fourth dedicated tab? Favorites are clearly used for 2 different main purposes among users. Some use them as a site bookmark. Others use them to get notices as well - I'm on that last (and probably the minority) group. To me it's a no brainer that who chooses to have favorites as a notification would love to have them in the global inbox - and who uses it as bookmarks would hate it. If this is opt-in as you said, I don't see how it's not "targetted at the user" as you say. This question is a perfect example of why this idea should be implemented. I would ask this exact request-feature question right now (entitled "Can we have favorites on the global inbox") if I haven't found this. So, instead of asking it, I just favorite it and take it as a question I would have asked. There is the possibility of a third group of people who would be highly unhappy about this: The ones who enjoy how the favorite notices work right now but prefer to keep the global inbox clean. A simple opt-in to that as well would solve this issue. Leave it there, see how people react, if it's useless then take it off. The recently revamped notifications area is the perfect place for these. But I hate the idea of separate opt-in / opt-out. Of those, #2 has never been particularly well-served. There's no search, no sharing - the only real benefit is that the list is attached to your account, so you can retrieve them from any device. Of course, this functionality is offered by a dizzying array of dedicated services, and increasingly build directly into web browsers... Along with search, sharing, etc. Trying to duplicate that on the site makes about as much sense as building a spell-checker into the editor. But #1 actually was effective at one time. Yeah, some folks complained about it. But a lot of that was due to lumping those notifications in with more direct responses, those "specifically targeted" events that you mention. Avoid teasing us with "you've got mail!" every time something happens to a post we're passively interested in, and I expect a lot of those complaints will disappear. For those that don't, well... Opting out is as easy as clicking that little star again. Also... This is the last little feature I liked in Quora that hasn't yet been implemented. I don't know if this will work, but this idea came to me for notifying users of changes to favourites. I think something like this innocuous little icon to the left of the user name (and also the tiny v-like dropdown left of it). Look forward to your thoughts! I think it would be nice to have the option, when marking a favourite, to opt for that question only whether or not notifications are desired. This is due to different use cases when adding a question to favourites. If this is too hard to implement, forget it - the old functionality of always notifying would be acceptable if it does not use the global inbox, otherwise I don't think I'll opt in (it'll flood quickly for heavy-use Stackers). If it may confuse new users, let the user preference be one of three? Related: What are favourites for? I would like to see a return of the activity log for favoured posts, but probably not merged with the in-box. One thought which came up from this disucsion (What does a small asterisk in the favorites tab in my user profile mean? ), is that under the favorites tab, favorites which have any update be highlighted with some color. So, if my favorites tab has a asterisk next to it, I would know that there have been updates to some of the favorites. 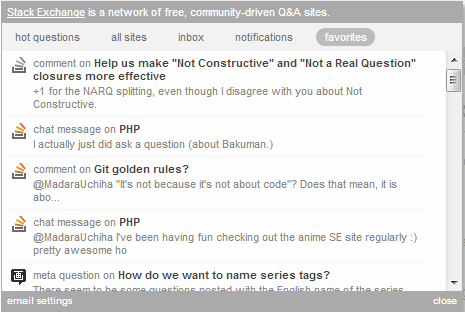 When I click on the Favorite tab, the questions that have any updates will be highlighted with some color. PS: For me, favorite updates are definitely not a candidate for Inbox. I don't like it. I like my inbox to be reserved for "important" notifications, ones that actually involve me. Who actually checks their favorites anyway? I say they're find in the dashboard where they are. I voted for adding notification on favorites. If you want to bookmark functionality, you can always use Vote Up. If a question or answer worth your bookmarking, it deserves a vote up. Currently I don't see any difference between vote up and favorites in user panel. All works the same. I advocates to use Favorite as kind of subscription tool, to get updates of the questions I favorited. Favorites also opted you into notices for those questions as if you were the owner (edits and new answers, at least). Yes, I would definitely like this feature. we're not 100% sold on this idea. We've had a policy to date that nothing goes into the inbox that isn't specifically targeted at a user; this would be tweaking that policy. It's actually not inconsistent with the policy, as I see it. In my desired use case, I have a question (or answer). I go to the appropriate SE site fully intending to write that post, after which point I would receive notifications in my inbox of answers, comments, edits, etc. - SE considers those "specifically targeted at a user." However, suppose once I get to that SE, I find that somebody else has already written that post. For a question, suppose it's unanswered, or for an answer, suppose it's something I've built into a production system and am relying on. If I had been the first to write it, I would have gotten notifications about answers or comments (e.g. "this is now insecure due to a compatibility change with XYZ," or "new research and best practices have come out advising against this for the following reason"), even years later, without polling the Favorites area of every site periodically. I would really like those notifications, as if I were the author of the post, because I would be the author if someone had not previously written something quite similar. This feature would reduce this current incentive for people to write duplicate or near-duplicate posts. I'm very much in favor of notifications about certain questions arriving in my inbox. A separate notification tab would be acceptable as well, as long as I'd still be shown a circled and colorful number next to my Super Drop-down Collider Menu button indicating the fact that there is something I'm probably interested in and haven't seen yet. Because in fact it's that circle I keep looking for whenever I open a SE page. I'm only using favorite marks for few questions, most of the pretty low traffic, and therefore won't mind being notified about all of them. But I guess others might be favoriting a lot more questions, some of them high-traffic meta discussions. For these cases it might be good to also have a way to override the global notification opt-in/opt-out on a per-question basis. After all, people would be using the „favorite“ mark for two different purposes, so a single UI for all of them is probably too much to ask for. Instead of a per-thread opt-in/opt-out, some separate notification mechanism would be nice as well, e.g. along the lines of Subscribing to questions and comments that don't belong to you. There are many times I come across a post on Stack Overflow that I really find interesting and would really like to know the outcome of, though it's not my post. Could there be a button to mark the post such that a message is sent to my inbox only when the OP has selected a final answer, or when a bounty has been awarded. I think that everyone here is agreed that having your inbox flooded with pointless "Me too", "Thanks so much", "You're right", and "I am having the same problem" is undesired. But I do think that many users of all reputation levels stumble across questions that they would like to know the answer to when it does get answered. So basically: One notification per question. And it is optional of course. I don't have enough rep in meta (why does basic rep not transfer between sites? pfft), so I'll post an answer. Make it like GitHub. Add a Watched for notifications, Starred for bookmarks and Forked (or whatever) maybe for just new answers. Seems to work for them, problem solved, move on. Seems like such a basic functionality to get updates on some question I'm interested in or requiring a solution for (that someone else asked). 2018 and still missing..? And wah, if you think it will lead to lengthy comment chats. Maybe limit comments to two per user. Again, done, move on. Mark questions to receive notifications and updates? Why don't I get notications for favorited questions? Not the answer you're looking for? Browse other questions tagged discussion favorites global-inbox . How can I receive notifications about favorite questions? How to get other people's question updates in global inbox? Is there a way to get notification when my favourite question gets an answer? How can we improve the mod tools? Should Stack Exchange in general be awarding “A”s for Effort? Let's Plan the Second Iteration of the Stack Exchange Quality Project!